Totum Cards - Save Money Now! SAVE MONEY NOW WITH YOUR TOTUM CARD! 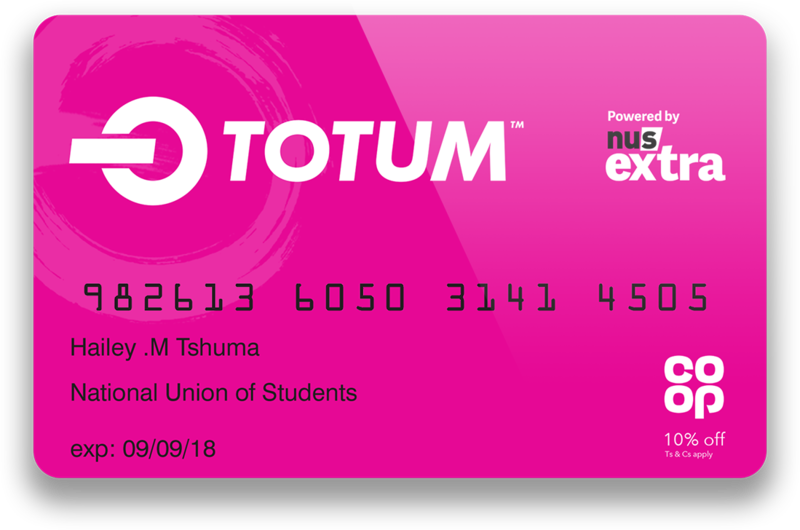 Totum is the brand new discount card for students, powered by NUS Extra! For the equivalent of only £1 per month for 12 months, you can enjoy access to a huge array of exclusive discounts, both online and on the high street. You can buy your brand new Totum card online, simply by clicking here and registering your University email address. This really is a student essential that you’ll need during your time at BCU! For as little as £1 a month, enjoy the benefits of NUS Extra giving you access to a huge array of exclusive UK discounts, both online and on the high street. Congratulations on graduating! You may be leaving university, but purchase an NUS Extra card before graduating and get massive savings with NUS Extra for up to another 3 years! Please note from 1 July 2017, NUS extra cards will no longer be available via alumni channels. Plus, it now includes International Student Identity Card (ISIC) for free giving you access to over 40,000 discounts worldwide, including tourist attractions, theme parks, accommodation and travel. So what are you waiting for?? Get buying! Don’t miss getting a discount on top of a discount! Yup. Your NUS extra card allows you 12% off your 16-25 railcard. Why miss out? Grab your essentials for 10% less with your Beautycard at @Superdrug. Add an NUS extra card to the mix and you’re absolutely sorted. From lectures to interviews, your 10% @ASOS discount will make sure you smash it. Renew your NUS extra card today! Click here! Music sounds better when it costs less. Ok, not true. But this is - 50% off Spotify Premium will save you a ton: Click here! Save 10% each time you pop into @Cooperative Food and you’ll save a ridiculous amount on your everyday buys! Only with an NUS extra card.